On the Lamb is one of the most spectacular, exposed, and unusual climbs in Tuolumne Meadows. 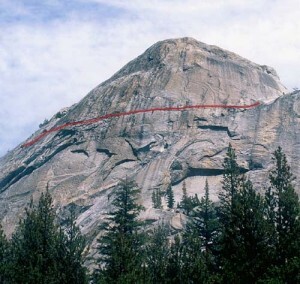 The route follows a 500-foot-long horizontal crack near the top of Lamb Dome (aka The Lamb). Few climbs have long traverses, and nearly no climbs have such a huge number of juggy holds, especially in Tuolumne. Many find On The Lamb so fun that they immediately turn around and reverse the climb. In fact, one of the best ways to climb On The Lamb is to start at the end, climb three pitches to the start of the route, then reverse. Which SuperTopo guidebooks include a topo for On the Lamb?